Add step-by-step walk-thru guidance to your website or application. WalkMe is a tool in the Tour Widget category of a tech stack. 4 companies use WalkMe including UserVoice, Constant Contact, and MOBI Wireless Management. Here’s a list of reasons why companies and developers use WalkMe. Using WalkMe's advanced Editor, you can create Walk-Thrus within minutes, without any technical knowledge, all by using a simple point-and-click interface. WalkMe supports all major browsers. Branched Walk-Thrus- Using the branching option, WalkMe allows you to create branched Walk-Thrus that can cover any possible business process. 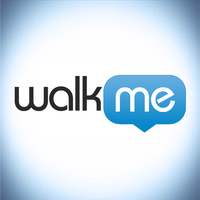 Full API- WalkMe delivers a full API, which allows you to utilize your imagination. Play your Walk-Thrus using your own buttons or links. Balloon Position- Set your instruction balloons for your Walk-Thru in different locations on the website. Timing Options- Customize the amount of time you would like to delay and display your step during the Walk-Thru playback. Skippable- Allow your users to skip steps without harming the Walk-Thru process. Advanced Settings- Set your Walk-Thru to seek out specific UI elements associated with a specific step according to specific parameters. Step Triggers- In order to support any possible business process, the WalkMe Editor delivers a set of step triggers, which allows you to specify when a step is finished and when it is time to advance to the next step.